It's, like, 3000 A.D., and Earth is a wasteland, mankind is nearly extinct. All remaining humans are either living in the woods as savages or enslaved in Denver by nine-foot-tall aliens from the planet Psychlo, looking much like rejects from the road company of "Cats." The aliens' chief war-monger is Terl (John Travolta), who's always talking about gaining "leverage" over his foes and who often says bad words like "crap" to show how evil he is. Travolta chews scenery, drinks cocktails that resemble urine, laughs a hyena-like cackle in his high-pitched voice and tries to act villainous, mostly unsuccessfully. This movie would never have been made without Travolta; he tried for some 15 years to bring it to the screen, which makes it all the more amazing that he seems utterly clueless as to the banality of his own dialogue. Barry Pepper, who's had nice supporting parts in "Saving Private Ryan" and elsewhere, gets his breakthrough leading-man try as Jonnie Goodboy Tyler, leader of the rebellious "man-animals." Playing the one-dimensional, goody-goody Christ figure, Pepper admirably goes through the motions, making patriotic speeches, reading the Declaration of Independence (don't ask) and symbolically cutting off a lock of his own hair. Forest Whitaker has been in much, much better films than this one, and he seems lost in the quagmire. The film is based on a 1982 sci-fi novel by L. Ron "Dianetics" Hubbard. (Reportedly, the book has generated $30 million in sales to date). 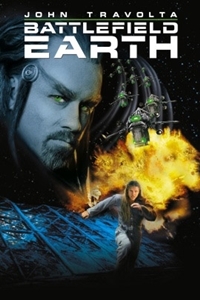 But "Battlefield Earth" feels like a rip-off of the first two "Planet of the Apes" movies, with a pro-nuke ending a la "Independence Day." In those films, the ape society had a political hierarchy, with the sympathetic chimps making those gorillas seem all the more nasty; here, the aliens are all evil, which makes them just boring. There are also elements lifted from "Blade Runner" (industrial, post-apocalyptic cityscapes), "The Matrix" (computer programs that download into the brain) and other, better films on which time is better spent. Poor Roger Christian. He's done some fine work as a second-unit guy on the "Star Wars" movies (he directed the pod race in "Phantom Menace"), but he's no match for Hubbard's story and Corey Mandell's screen adaptation. Lacking anything interesting to say, Christian tries to make things fun by shooting almost every scene with the camera cocked to one side, inducing headaches and stiff necks. Lacking an exciting climax, Christian shoots the final man-versus-aliens sequence with lots of fast cuts, dark scenes and other tricks that make it very difficult to tell exactly what's going on. And he maintains a family-friendly PG rating by minimizing onscreen violence, substituting sound effects and reaction shots for the sight of heads blowing up. For a $50-million movie, there are lots and lots of digital effects shots. Trouble is, in this post-"Phantom Menace" world, that's no longer an impressive feat. And there's really nothing here you haven't seen before, except maybe the sight of John Travolta walking around with tubes in his nose. Travolta jumps genres to make a sci-fi picture. He casts himself against type and plays the villain. Those fifteen years of effort apparently didn't go into the screenplay. Three strikes, yer out! Starring John Travolta, Barry Pepper, Forest Whitaker, Kim Coates and Sabine Karsenti. Directed by Roger Christian. Written by Corey Mandel and J.D. Shapiro. Based on the novel by L. Ron Hubbard. Produced by Jonathan D. Krane, John Travolta, and Elie Samaha. Released by Warner Bros.